Did you lose a passport? For passports lost or stolen overseas, please contact the nearest U.S. Embassy or Consulate. You can also complete a DS-64 form that explains what happened to the passport; whether it was lost, stolen or even damaged. You can obtain this form at any local post office or print it from your computer and fill it out in black pen. If the passport is damaged you will have to include the damaged passport in addition to a completed and signed DS-64 form. Now if you would also like to apply for a replacement passport at the same time you will still need a completed and signed DS-64 and if it was damaged, you will to submit your damaged passport with the application. Along with that you will need to also follow the exact same steps as applying for a new passport. Once your passport has been reported lost or stolen by telephone or a DS-64 form is received by the Passport Agency, your lost or stolen passport will be invalidated immediately and can no longer be used to travel. 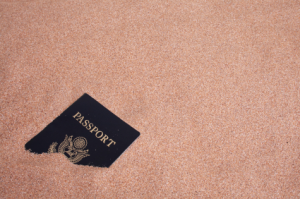 Once a passport is reported lost or stolen, it cannot be re-validated. If you recover the passport after you have reported it lost or stolen, please submit it to the address listed above. When you submit it, if requested – it will be cancelled and returned to you. If a return is not requested, it will be destroyed. The information you provide when reporting it lost or stolen is entered in our Consular Lost/Stolen Passport System. Keep in mind misplacing your passport often can cause you to be issued a passport that will only be valid a year at a time or to be denied all together. 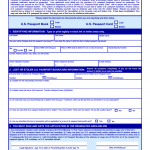 If you have checked the Online Passport Status System or contacted the National Passport Information Center and they have informed you that your new passport has been mailed out, but you have not received it after ten business days, you should contact the National Passport Information Center to report the non-receipt of the passport. If you do not report the non-receipt of your passport within 90 days from the date the passport was issued, you will be required to reapply and pay all applicable fees. A lost / stolen / passport will be processed according to the official Department of State passport processing times. The fastest option to replace a lost passport will be to visit a Regional Passport Office or pay an expediting company to do it for you. Can I continue to use my passport if it has been damaged? Normal wear of a U.S. passport is understandable and likely does not constitute “damage”. For instance, the expected bend of a passport after being carried in your back pocket or fanning of the visa pages after extensive opening and closing. In most cases of normal wear, you may renew your passport by mail. I found someone’s lost passport, what should I do with it? If I reported my passport Lost and now I have found it can I use it to travel? Once you report your passport lost or stolen it cannot be re-validated. You will have to re-apply for a new passport if you intend to travel. The application is asking for my previous passport number, what do I do? You must put nine zero’s and estimate the time of issuance. Will losing my passport multiple times cause delays when re applying? When you lose your passport it is reported and kept on record. When you repeatedly misplace your passport not only can it cause delays when you are re applying but it can also cause the State Department to issue you a passport that is only valid for a year. This usually happens if you have lost multiple passports in a short amount of time or you have used the DS-64 form more than two times.